Note series of Xiaomi is quite popular across Asia. This time Xiaomi launched Note 5 Pro with infinity display having 18:9 increases display area by 12.5% offering more coverage of visuals. 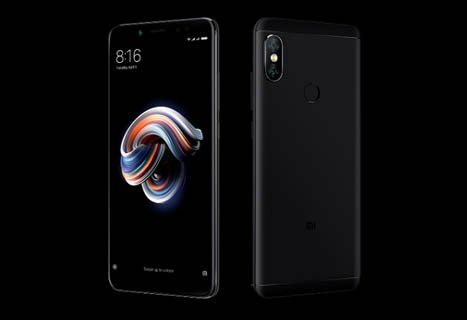 This handset also featuring Android v7.1.2 (Nougat) OS, 5.99 inches FHD+ display, Qualcomm SDM636 Snapdragon 636 CPU, 64 GB Internal | 128 GB SD Card support | 4/6 GB RAM. and 4000 mAh battery. The smartphone built is quite sturdy where the front has 2.5D Gorilla Glass and sides and back is aluminum made. Even after having 8.1 mm thickness and 181 grams of weight it feels compact in hands. It is designed to spread corner impacts to prevent screen damage. The right side has volume and power button and bottom of the phone is housing microUSB 2.0 slot, speaker grille, and a 3.5mm audio jack. The 12+5MP dual camera delivers high-quality images and large 1.25μm pixel helps in taking crystal clear photographs even in low light. Mi is Pairing high-quality Sony and Samsung sensors in its camera for sensing the depth of field for better details. The rear camera takes beautiful pictures and dual setup helps in taking incredibly good bokeh effects. It also features Electronic Image Stabilization to minimize blurring caused by hand jitters during video recording. The 20MP front camera has Beautify 4.0 is enhanced and specially optimized for Indian people using new AI-based technology. Note 5 Pro is powered by the Snapdragon 636 which is Qualcomm's latest chipset with 14nm technology It can outperform its predecessor processor by up to 40%. Snapdragon 636 coupled with the 6GB RAM providing a smooth experience while using multiple apps or playing heavy games. Along with Fingerprint security, the phone also has Face Unlock feature where the handset will automatically recognize your face and unlock your phone within 0.2 seconds. Inside the phone 4000mAh high-capacity battery along with system-level MIUI optimizations capable of giving up to 19 days of standby time. If you like to watch movies or programs in mobile it offers about the 14 hours of video playback. Display protected by the Corning Gorilla Glass. It also has LED flash for the front camera. FM radio and Infrared is supported. Performance is quite good even for gaming under this price. It has MicroUSB 2.0 instead of Type C slot. No Quick Charge 3.0 support. Hybrid Dual SIM (No dedicated slot for the Memory card).